A key factor in understanding the diverse views and experiences reported in the 2002 National Survey of Latinos was how long Latinos and their families have been in the United States. The Hispanic population is very diverse in this regard, covering a range from recently arrived immigrants to those whose ancestors have lived in the United States for many generations. This analysis divides Latinos into three groups: first generation, second generation, and third generation or higher. First-generation Latinos were born outside the United States or on the island of Puerto Rico (63%). Second-generation Latinos were born in the United States to immigrant parents (19%). Third- or higher-generation Latinos were born in the United States to U.S.-born parents (17%) (see Chart 1). The largest differences in responses between successive generations exist between first- and second-generation Latinos, or between those who are foreign born and those who were born in the United States. 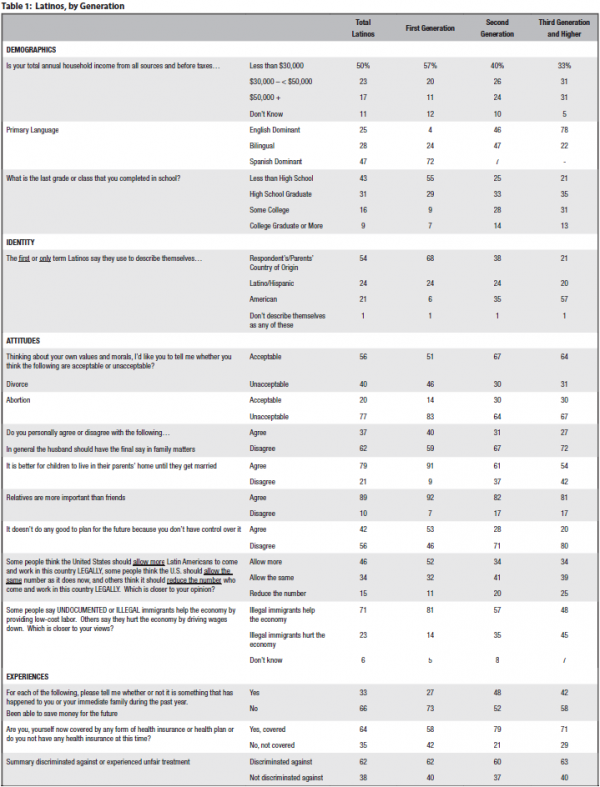 These differences include demographic characteristics, views on identity, and attitudes toward social values, as well as personal experiences in the United States. 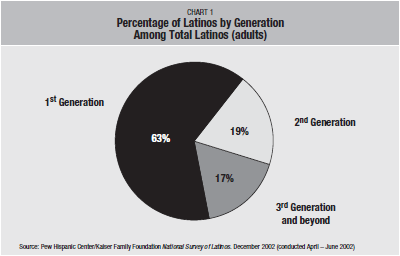 First-generation Latinos report having lower household incomes than second-generation Latinos. Nearly six in ten (57%) fi rst-generation Latinos report annual household incomes of less than $30,000, compared to four in ten secondgeneration Latinos. Alternatively, more than twice as many second-generation Latinos (24%) as fi rst-generation Latinos (11%) report household incomes of $50,000 or more. Along with income, one of the most pronounced demographic differences between first- and second-generation Latinos is level of education. More than half (55%) of first-generation Latinos have less than a high school education, compared to a quarter of second-generation Latinos. Furthermore, second-generation Latinos (42%) are over two and a half times more likely to report attending some college or graduating from college than first-generation Latinos (16%). Attitudes towards ethnic and national identity are very different between first- and second-generation Latinos. When asked which term they primarily use to describe themselves, first-generation Latinos are much more likely to select their country of origin in Latin America than are second-generation Latinos (68% vs. 38%). Only six percent of first-generation Latinos report using the term “American” to describe themselves compared to more than a third (35%) of second-generation Latinos. However, an equal number (25%) of both first- and second-generation Latinos report using Latino/Hispanic as the primary term to express identity. In evaluating their social values, first-generation Latinos are more likely to express views generally considered more conservative than second-generation Latinos. When asked whether they thought divorce was unacceptable, nearly half (46%) of first-generation Latinos reported they believe it is unacceptable, compared to three in ten (30%) second-generation Latinos. When asked about abortion, more than eight in ten (83%) first-generation Latinos said it is unacceptable, compared to about two-thirds (64%) of second-generation Latinos. Attitudes towards immigration are also considerably different by generation. When asked whether the United States should allow more, allow the same or reduce the number of immigrants to work in this country legally, 52% of first-generation Latinos thought the United States should allow more immigrants to work here legally, compared to 34% of second-generation Latinos. Attitudes towards illegal immigration were even more pronounced. When asked whether illegal immigrants help or hurt the economy, eight in ten (81%) first-generation Latinos reported illegal immigrants help the economy, compared to less than six in ten (57%) second-generation Latinos. Furthermore, the overwhelming majority (91%) of first-generation Latinos report agreeing that it is better for children to live in their parent’s home until they get married, compared to six in ten (61%) second-generation Latinos. Likewise, while overwhelming majorities of both first- and second-generation Latinos report that relatives are more important than friends, first-generation Latinos (92%) are even more likely than second-generation Latinos (82%) to agree. In some aspects of their lives, second-generation Latinos appear to be better off than their first-generation counterparts, especially when it comes to health insurance coverage and the ability to save money for the future. Nearly twice as many second-generation Latinos report having been able to save money for the future compared to first-generation Latinos (48% vs. 27%). Half as many second-generation Latinos (21%) report being without health insurance coverage compared to first-generation Latinos (42%). It is important to keep in mind that second-generation Latinos report having a higher household income than first-generation Latinos, so it isn’t surprising they differ on these money-related issues. On the other hand, first- and second-generation Latinos report similar experiences with discrimination. About six in ten first- (62%) and second-generation (60%) Hispanics report they or someone close to them have been discriminated against or treated unfairly because of their race or ethnicity, at some time in their lives. While differences between first and second generations are very pronounced, the differences between second and third generations or higher are much more nuanced. In fact, these two groups of Latinos exhibit more similarities than differences. Second- and third-generation or higher Hispanics report having very similar levels of both income and education. For example, about a quarter (24%) of second-generation Latinos report annual household incomes of $50,000 or more, compared to slightly more third-generation or higher Latinos (31%). At least three out of four second-generation Latinos and third-generation or higher Latinos report they have at least a high school diploma or the equivalent (75% and 81%, respectively). On the other hand, second- and third-generation or higher Latinos still diff er in the language they primarily speak and read. Less than half (46%) of second-generation Latinos, compared to nearly eight in ten (78%) third-generation or higher Latinos, are English dominant. More than twice as many second-generation Latinos (47%) are bilingual compared to third-generation or higher Latinos (22%). Second- and third-generation or higher Latinos also differ substantially in their preferences and views on identity. 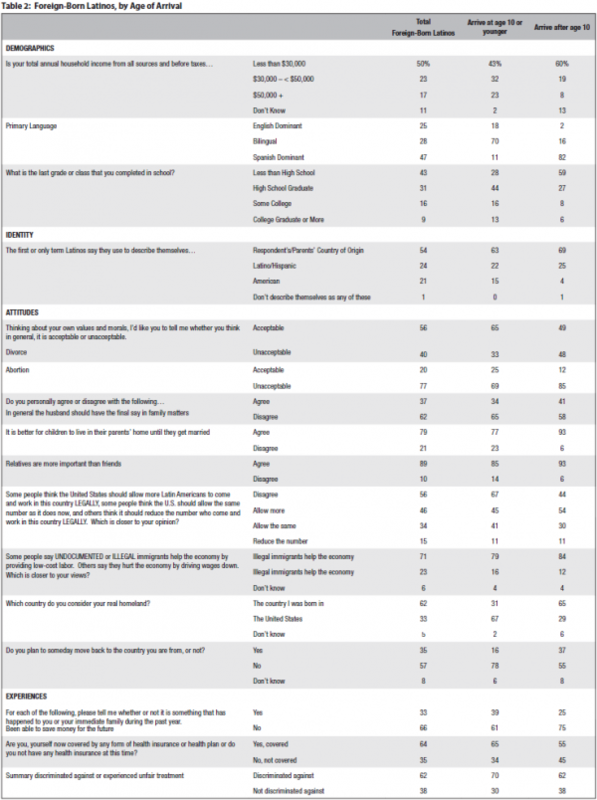 When asked which terms they use primarily to describe themselves— “Latino/Hispanic,” their or their parents’ country of origin (for example, “Mexican”), or “American”—secondgeneration Latinos are more likely to report that they use their or their parents’ country of origin than third-generation or higher Latinos (38% vs. 21%). Just over three out of ten (35%) second-generation Latinos, compared to almost six in ten (57%) third-generation or higher Latinos, use “American” fi rst or only when describing themselves. When asked whether the United States should allow more, allow the same, or reduce the number of immigrants who come to work in this country legally, second- and third-generation or higher Latinos expressed similar views. About a third (34%) of second- and third-generation or higher Latinos agree the United States should allow more immigrants to come to work in the country legally. About four in ten second- (41%) and third-generation or higher (39%) Latinos report the United States should allow the same amount. Fewer, yet still a substantial number of second- (20%) and third-generation or higher Latinos (25%), report the United States should reduce the number of immigrants who come to work in this country legally. Although they agree on the number of legal immigrants who should be allowed in the United States, second- and third-generation or higher Latinos somewhat disagree on the value of illegal immigration. For example, when asked whether illegal immigrants help or hurt the economy, 57% of second-generation Latinos reported illegal immigrants help the economy compared to 48% of third-generation or higher Latinos. Second-generation Latinos often share very similar views on social values with third-generation or higher Latinos. When asked whether they thought divorce was acceptable, about two in three (67%) second-generation Latinos reported they believe it is acceptable, which is similar to 64% of third-generation or higher Latinos who agreed. When asked about abortion, identical proportions (30%) of second- and third-generation or higher Latinos report it is acceptable. When it comes to family and gender roles, second- and third-generation or higher Latinos also share very similar attitudes. Roughly three in ten second- (31%) and third-generation or higher (27%) Latinos report that in general, the husband should have the final say in family matters. While about nine in ten (91%) first-generation Latinos report agreeing that it is better for children to live in their parent’s home until they get married, substantially fewer second-generation (61%) and third-generation or higher (54%) Latinos agree. Furthermore, about eight in ten second-generation Latinos (82%) and an almost identical proportion of third-generation or higher (81%) Latinos agree relatives are more important than friends. While over half of first-generation Latinos (53%) reports that it doesn’t do any good to plan for the future because you have no control over it, second- and third-generation and higher Latinos report less fatalistic outlooks on planning for the future. Twenty-eight percent of second-generation Latinos reports it doesn’t do any good to plan for the future, slightly more than one in fi ve (20%) third-generation or higher Latinos. Second- and third-generation or higher Latinos report similar personal experiences, especially when it comes to health insurance and the ability to save money for the future, as well as experiences with discrimination or unfair treatment. About eight in ten (79%) second-generation Latinos report they are covered by some type of health insurance, compared to slightly fewer third-generation or higher Latinos (71%). Second- and third-generation or higher Latinos also report similar experiences when it comes to the ability to save money for the future. Forty-eight percent of second generation Latinos and 42% of third-generation or higher Latinos report they or their family have been able to save money during the past year. Roughly six in ten second- (60%) and third-generation or higher (63%) Latinos also report they or someone close to them have been discriminated against or treated unfairly, including receiving poor treatment in stores and restaurants, or being insulted, because of their race or ethnicity. More than six in ten (63%) adult Latinos are categorized as fi rst generation (including those born in Puerto Rico). With such a large group making up most of the adult Latino population, it is important to look at an additional division that can be made within this group to further illuminate the diversity among the Latino population. One key characteristic of Latino immigrants arriving at or before the age of ten is that they are much more likely to be bilingual or English dominant than those arriving after the age of ten. Seven in ten (70%) Latino immigrants who arrived at or before the age of ten are bilingual, compared to less than one in five (16%) Latino immigrants who arrived after the age of ten. Furthermore, nearly one in fi ve (18%) Latino immigrants arriving at or before the age of ten are English dominant, compared to only 2% of Latino immigrants arriving after the age of ten. Those who arrived when they were younger also seem more likely to enjoy more financial wealth. Twice as many Latino immigrants who arrived at age ten or younger report a total annual household income of $30,000 or more, compared to those who arrived after the age of ten (55% vs. 27%). Moreover, in regards to education, Latino immigrants arriving at age ten or younger are also much more likely to report having at least a high school diploma (or the equivalent) compared to Latino immigrants arriving in the United States after the age of ten (73% vs. 41%). When asked about the terms they use to describe themselves, similar proportions of Latino immigrants arriving at or before the age of ten and Latino immigrants arriving after the age of ten indicate that they prefer to identify themselves first in terms of their country of origin (63% vs. 69%), and as “Latino/ Hispanic” (22% vs. 25%). However, Latino immigrants arriving at or before the age of ten are more likely to report describing themselves as “American,” compared to Latino immigrants arriving after the age of ten (15% vs. 4%), though they are still half as likely to call themselves Americans than are second-generation Hispanics (35%). Latino immigrants arriving at or before the age of ten also tend to be less socially conservative in their views towards divorce and abortion. For example, they are more likely than Latino immigrants arriving after the age of ten to report that they fi nd divorce acceptable (65% vs. 49%). These two groups also diff er somewhat in their attitudes toward the family. For example, the overwhelming majority (93%) of Latino immigrants arriving after the age of ten report agreeing that it is better for children to live in their parents’ home until they get married, compared to fewer, but still a strong majority (77%), of Latino immigrants arriving at or before the age of ten. However, both immigrant groups are more likely to share a common view when it comes to the importance of relatives compared to friends. Eighty-three percent of Latino immigrants arriving at or before the age of ten, and 93% of Latino immigrants arriving after the age of ten report they agree that relatives are more important than friends. One striking diff erence between these immigrant groups revolves around the concept of fatalism. While a third (33%) of Latino immigrants arriving at or before the age of ten agree that it doesn’t do any good to plan for the future because you don’t have control over it, more than half (55%) of Latino immigrants arriving after the age of ten report they agree. Not surprisingly, Latino immigrants arriving at or before the age of ten show a deeper connection to the United States, compared to Latino immigrants arriving after the age of ten. When asked which country they consider their real homeland, twice as many report they consider the United States as their homeland (67% vs. 29%). Furthermore, half as many Latino immigrants arriving at or before the age of ten, as Latino immigrants arriving after the age of ten, report they plan to someday move back to their countries of origin (16% vs. 37%). While highlighting differences between and among generations, we do not mean to suggest that it is solely generation in the United States that is causing these differences. In fact, based on logistic regression analysis, once factors such as age, gender, income, country of origin, place of residence (suburban, urban, or rural), political party, religion, citizenship, and primary language are controlled, it is evident that some of these factors, particularly primary language, are more useful than others in explaining differences in attitudes. However, while generation may not be the only variable to explain the mechanisms that produce diverse opinions in the Latino population, it is an essential form of demographic categorization. Moreover, differences in primary language among Latinos are substantially consistent with generational differences, and thus generation can act as a useful demographic proxy for language in analyzing the Hispanic population. Of those who were interviewed, 2,929 identified themselves as being of Hispanic or Latin origin or descent (based on the question “Are you, yourself of Hispanic or Latin origin or descent, such as Mexican, Puerto Rican, Cuban, Dominican, Central or South American, Caribbean or some other Latin background?”). Throughout this report they will be referred to interchangeably as either “Latinos” or “Hispanics.” In addition, interviews were conducted with 1,008 non- Hispanic whites and 171 non-Hispanic African Americans. The margin of sampling error is +/- 2.41 percentage points for Latinos overall. The sample sizes and margins of error for different generations of Latinos in the United States are shown in the table below. The report also highlights results for other subgroups of Latinos. Please see the introduction of the report for definitions, sample sizes, and margins of sampling error of other key groups. In the 2000 Census, some 35,306,000 people living in the United States identifi ed themselves as Hispanic/Latino. That represented a 142% increase over the 1980 Census count, and means that Latinos now make up nearly 13% of the U.S. population overall. This rapid growth is among one of the most important demographic trends shaping the future of the United States. Recognizing this fact, the Kaiser Family Foundation and the Pew Hispanic Center joined forces to conduct a comprehensive national survey of the Hispanic population.